SeaWestNews | David Suzuki’s insect-feed brainchild will help make salmon farming more sustainable but he is bugged about it. The short and unremarkable life of the Black Soldier Fly involves nothing more than mating and laying eggs. It does not eat, sting or bite and is not a pest or a vector for disease. 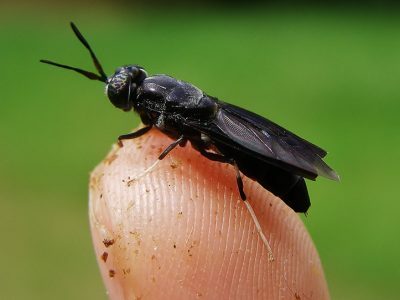 But now the Black Soldier Fly is at the heart of a global mission to reduce overfishing in our oceans. Enterra Feed Corporation, a Langley, B.C. 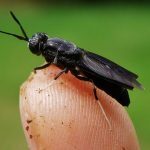 – based company announced this week that it has received new approvals from the U.S. Food and Drug Administration (FDA) to include Black Soldier Fly Larvae Meal in feed for salmonids. Ironically, this high-protein ingredient, targeted for more sustainable fish farming around the world is mainly the brainchild of environmentalist David Suzuki, noted for his opposition to ocean-based salmon aquaculture in B.C. Suzuki, however, has declared publically that he would oppose using the feed in open-net salmon aquaculture – a primary end-user of Enterra’s products. The practice of catching wild fish to feed farmed fish contributes to overfishing and has drawn criticism from conservationists. “Fishmeal is a common ingredient in salmonid feed due its nutritional profile and digestibility, but the production of fishmeal, which is primarily made from wild caught marine fish, has depleted fish stocks in the world’s oceans,” said Victoria Leung, Enterra’s manager of marketing and operations. Current estimates peg the need at 1.2 kg of forage fish to be caught to yield 1kg of Atlantic salmon. Enterra manufactures and markets feed ingredients derived from the larvae of the black soldier fly, a beneficial insect species that can be found naturally in tropical and temperate regions around the world. The larvae are reared under controlled conditions on locally sourced, pre-consumer food waste containing valuable nutrients that would otherwise be lost in landfill, compost or waste-to-energy facilities. More applications are currently in process for Enterra’s products to serve additional markets in the USA and Canada, a company statement said.